Soup is not only one of the most soul-satisfying meals out there, but it is also generally truly frugal. I grew up eating a lot of home-made soups, and all of them started off as ways to make use of leftovers, or something that we had in surplus, or were made to feed a lot of people very cheaply. Making soup is the perfect way to use every scrap of food, to eke every smidgen of flavor and to coax every little bit of nutrition from every component, and as such, putting together a pot of soup is the perfect way to make do with what you have. And in these trying financial times, making do is a good skill to cultivate. The soups I grew up eating were most often based on the bones of an animal carcass–a roasted turkey or chicken, or the big shank bone of a ham. Or the ribs from a batch of beef short ribs. They were created as ways to use up every little bit of food possible, because we weren’t wealthy when I was a kid, and both sets of grandparents had lived through the Great Depression, so the ways of frugality came naturally to my parents. Cooked with the meat bones were beans, lentils and vegetables–and the truth is this–the soup was based on bones, but meat made up a very small percentage by weight of the bulk of the soup. Most of the volume of our soups was made up of vegetables–some of them a bit past their prime. And that is perfectly fine and dandy. Potatoes that have started to sprout and have gone a bit soft make gluey mashed potatoes and are nasty fried, but if you boil them in a soup, they are fine. (Remove the shoots and sprouts first, though, obviously!) Carrots that are too big and woody to be eaten in a salad taste fine boiled in a soup. Celery that has gotten too rubbery to put into potato salad still lends delicious flavor to soup. And over-ripe tomatoes that are too squishy to cut into slices are just fine simmered into a soup. Sometimes, you can use parts of vegetables that you would not normally eat in soup, thus using every scrap of nutrition available in the plant. Take, for example, the case of broccoli stalks. Those big, tough, woody green stems are discarded in most kitchens, but not mine. In addition to peeling and eating them raw–the celadon-colored slices are sweet and crisp–or using them in stir-fried dishes, especially kung pao chicken, just as China Fortune, here in Athens does. The sweetness of the stalks goes beautifully with the spicy sauce, and the color is very pretty in the dish, contrasting nicely with the brick red dried chilies. 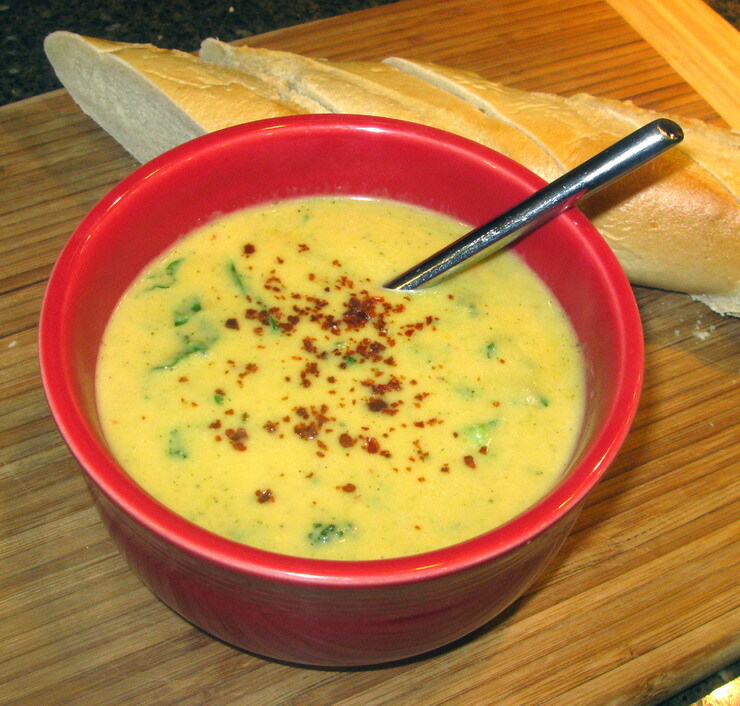 I also use broccoli stalks to make the basis for a creamy broccoli-cheese soup–arguably a favorite soup among Americans–that doesn’t need to use much in the way of cream to make it smooth, nor does it rely on any roux, flour or cornstarch to thicken it. The broccoli stalks, with a little help from some potatoes–preferably some which have gone a bit soft and sprouty–and sometimes some leftover rice, make a deliciously, velvety smooth soup base with superior flavor and no floury-aftertaste. AND–this tasty soup comes without the added calories from refined starches or extra fat from roux. And it all couldn’t be simpler, more frugal or more satisfying to both the stomach and the wallet, because I am using stuff that might otherwise get thrown out. Being frugal feels awfully good, especially when the result is a creamy soup that is surprisingly light. How do I go about making this superior soup? Well, I talk the broccoli stalks and peel the tough, stringy outer skin off with a vegetable peeler, and into the compost pile. Then, I slice off the nasty, tough end of the stalks and send that out to the compost, too. 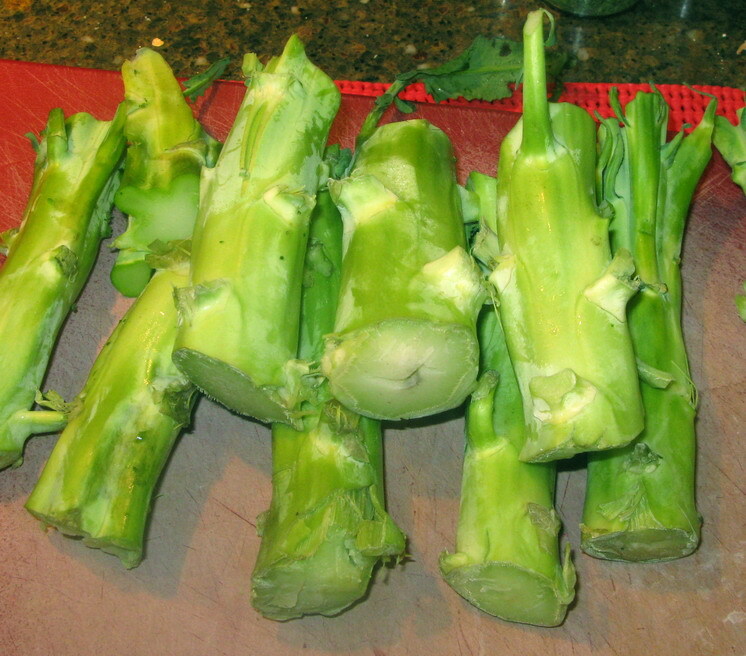 Then, I just cut them up into 1/4″ thick slices, along with some of the florets and smaller stalks of my broccoli. (I only use about half of the upper head of the broccoli in the soup base. The rest is cut up into small spoon-sized bits to be added to the soup at the very end so the broccoli barely cooks and is served bright green and tender-crisp. Then I also peel and de-stalk the rather seedy-looking potatoes and cut them into chunks. And then I cut about three cups of thinly sliced onions, and peel and mince five cloves of garlic. I melt 3 tablespoons of butter in the soup pot, saute the onions until they are a deep golden brown, add the garlic, keep cooking and stirring and do that until the onions are a deep reddish brown. Then, I add herbs and seasonings, and either wine or beer to deglaze the pot. Then, in goes vegetable broth, and the cut up bits of broccoli stalk and florets and the potatoes. If I have leftover rice cold in the fridge, I toss in a cup or so of that as well. I make sure that the vegetables are just covered by the broth and I bring it to a simmer, and let everything cook until the vegetables are fork tender. While that is going on, I grate every bit of cheese I have laying around the house. This is the perfect way to use up oddments of cheese, and nearly every cheese tastes great in this soup, though this time around, I used a bit of havarti, butterkaese, and sharp cheddar. But you can use anything you have around. When the vegetables are softened., I take the pot off the heat, pull out my trusty immersion blender and puree everything in the pot. I make sure to keep going until everything is smooth–no lumpy bits please! Then, I take my shredded cheese and sprinkle it into the soup -while the blender is still going- which is the best way to get the cheese to melt quickly and emulsify in the soup without having to bind everything with roux. Once the cheese is fully incorporated, I add about a half cup to a cup of half-and half or cream to the soup, correct the seasoning (cheese is salty, so there is no sense in adding salt until you can taste the soup with the cheese), and then stir in the broccoli. 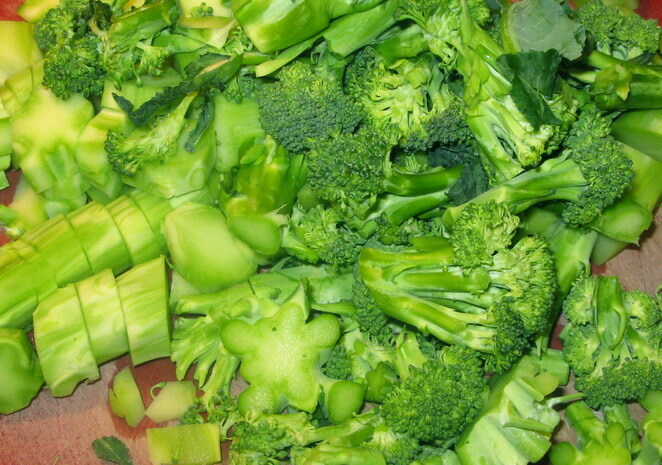 I turn the fire back on the lowest setting and stir for about three minutes, or until the small bits of broccoli floret are quite tender and the green has brightened considerably. And then, voila! I serve it forth. I did do something different when I made the soup last night–I added finely shredded kale leaves at the very end after the broccoli florets had been in the soup for about a minute. I had some kale sitting around and decided that it would taste great in the soup and lo and behold, I was right. The leaves were sweet, yet slightly bitter and mixed beautifully with the nutty cheeses, and the deeper green went nicely with the brilliant emerald florets. Served with toasted baguette, this soup was a satisfying in every way–to the senses, to the stomach, and the soul. Melt butter in a heavy-bottomed soup pot on medium heat. Add onions and sprinkle with salt. Cook, stirring, until the onions are a deep golden brown. Add garlic, thyme, Aleppo pepper and tarragon, and cook, stirring, until the onions are a deep reddish brown–about four more minutes. Deglaze the pot with the beer, wine or sherry, and when the alcohol has boiled off, add the broth. Add the broccoli stalks, potatoes and the first bunch of florets, and simmer until the vegetables are fork-tender. Turn off heat and using an immersion blender, puree the soup until it is perfectly smooth. Incorporate the cream while the blender is running, and melt in the cheese with the blender. When the cheese is blended and melted, add the reserved broccoli, let it cook for a minute, then add the kale and let cook for two minutes. Taste for salt and correct seasoning as needed. Sprinkle each serving with Aleppo pepper and serve with toasted bread or croutons. Note: You can use lots of other vegetables in this soup. You could add some celery, or some carrots to the soup base to be pureed in, but not much because they are strong in flavor. You can add a bit of turnips, too–but only if they are fairly sweet. Also, instead of the cream or half and half, you could use Greek style yogurt or sour cream to add a tangy note to the dish. Either one would be spectacular. It all depends on what is in your pantry that needs to be used up when this soup is on the stove! I’m so short of time right now that I don’t use broccoli stalks but when I did, there were a number of things I did with them. As you say, the most important step is to peel them. The outer skin is tough and nasty. But a peeled stalk is juicy, crunchy and tender. My most common use was to slice them for stir-fry. They can also be shredded for “cole”slaw. Shredded and squeezed dry to saute with onion & mushrooms. Cut into sticks for crudites. Soup, of course. Tasty stuff! I’m almost ashamed to ask — but can you use instant mashed potatoes in this? My husband insisted on buying a box, even though I offered to get potatoes and do it the right way; he wanted something he could make himself, but he only ate them once, and now I have these instant mashed potatoes in my pantry. Elizabeth–it is an old lunch-lady’s trick to use instant mashed potatoes to thicken soups and stews. The way to do it is to make the potatoes first, but make them with too much water, and when they have rehydrated, whisk them furiously to make a thinnish paste. 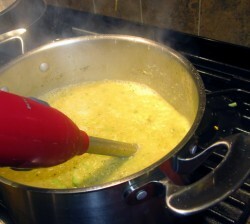 Then, while your immersion blender is going, pour the paste into the soup, and blend well. If you try to just sprinkle the potato flakes into the soup, you risk getting big gloobery lumps in your soup. No fun. Not tasty. It is a pretty good way to use up dehydrated potatoes–which is better than throwing them away and is certainly better than eating them as is! Mmmm. My csa is abundant in broccoli at the moment, much as I love it there is so much of it that this will be a wonderful way to use it! Thanks for sharing! Barbara, I make a similar soup (never thought of the rice though!) and I have to agree about any kind of cheese being good. Here in the UK, Stilton is the usual pairing but it’s great with any combination of hard or blue cheese! Although I have to admit I haven’t tried soft cheeses like brie…the rind would probably be a problem, I think. I love the idea of reserving a few florets to the last minute and will be duly pinching that idea the next time!! I am glad to hear you say all that about older veggies and aromatics. One of my cookbooks, which I like otherwise, makes this big deal about how it is passe or some such nonsense to make soup out of anything less than perfect onions, etc, and every time I throw an older onion into a soup (there’s one in the chicken stock simmering away for the soup I am cooking right now with the older sweet potato) I think well good lord if I listened to that book I’d be throwing away a perfectly edible onion. After all before mass transit those onions would be looking pretty sad by now in the north but people still used them! Meg, you could scoop the soft part of the cheese in Brie or Camembert and leave the rind–but that is wasteful. But I can tell you for a fact that the rind will not melt smoothly at all. Laura–that cookbook author who said “using old vegetables is passe” torques my gizzard! That is so–elitist! And wrong, too. Oh, I had a chef once in culinary school who saw me use soft carrots in a poaching liquid for salmon tell me “garbage in, garbage out,” which is just wrong, but most of the chefs I worked with were frugal to a fault and TOLD us to use less than perfect vegetables in stock, soup and sauce-making so as to extract every last bit of goodness out of what we had and so as to not waste vegetables. That makes me cranky enough to make me want to write a post about that! I mostly followed your recipe for this soup, and it was delicious! I added a sweet potato since I only had to a couple tiny regular potatoes, and it added a nice, subtle sweetness. Another use for the broccoli stalks is to use them when doing fresh juice. Then you don’t have to bother with peeling them, just drop them in the juicer. I know this is not helping with your soup but does help get as much use as you can from your broccoli. I am going to make some of this soup as I have broccoli and kale around all the time. I put them in my juice daily. I can’t wait to try this soup it just sounds so wonderful. I have a question though…when do you add the rice? Does it stay whole or does it get blended? Thanks for posting this recipe! I wish that I could have just printed the recipe but no page numbers so could not just print that part. Just copy and paste the recipe into a word file and print it that way. Even I do it myself that way!